For optimal health, when shopping for personal care products, read labels and avoid the following 24 potentially harmful ingredients. Aluminum is a chemical salt with absorbent and disinfectant properties. It’s often used in deodorants and antiperspirants, and is easily absorbed into the skin. A recent study of breast cancer patients found higher amounts of aluminum in the outer regions of the breast where antiperspirant is usually applied. A study in the Journal of Toxicology and Environmental Health showed that aluminum accumulation in body tissues leads to impaired kidney function, bone disease, and tissue damage. [Aug 1996; 48(6):649-65] Aluminum has also been found in the brains of Alzheimer’s patients. Animal testing has left many innocent creatures maimed, diseased, and crippled. Scientists are developing new ways to test cosmetics that do not require the needless suffering of animals. We may further discourage the practice by refusing to purchase products from companies that perform animal testing. Acetone is a strong solvent used in many nail-polish removers (as well as in some paints and varnishes). It’s known to irritate the eyes and lungs, and can cause redness and irritation of skin. Chemical sunscreens, like oxybenzone, benzophenone-3, and octyl methoxycinnamate, have been shown to disrupt endocrine activity. Oxybenzone is absorbed into the skin where it filters UV light, converting it from light to heat, which may damage growing cells. Titanium dioxide and zinc oxide are safer alternatives. Disodium-EDTA is a salt used in cosmetics and personal care products, often as a penetration enhancer, allowing other chemicals to penetrate deeper into the skin, as well as a “chelating” agent that improves the performance of cleansing products. It is found in contact solution, eye drops, shower and bath products, and more. Though approved as safe by the FDA, high doses have been shown in some studies to disrupt hormone function and mutate cells. Ethyl acetate is a flammable liquid used as a solvent in many cosmetics, including nail polish remover, perfume, shampoo, and aftershave. (It’s also used in paint remover and dishwashing liquid.) Listed on the EPA’s Hazardous Waste list, it’s known to be irritating to the eyes and respiratory tract and may potentially depress the nervous system. Avoid at all costs, especially on your face. Formaldehyde is a colorless gas and a known carcinogen used in many nail polishes. The U.S. National Toxicology Program lists it as “reasonably anticipated to cause cancer.” It can also cause allergic reactions, contact dermatitis, headaches, and chronic fatigue. Lab studies have shown that rats exposed to the vapors developed nasal cancer. Fragrance (synthetic) may contain as many as 200 undeclared ingredients. Some of them can be phthalates-hormone-altering preservatives. There is often no way of knowing, since companies don’t have to reveal the chemical constituents of a fragrance. They can just list it as “fragrance,” when it may contain hundreds of chemicals. Potential problems include: headaches, coughing, vomiting, skin rashes, hyperpigmentation, allergies, and dizziness. Caution: Avoid the use any product with the word “fragrance” in the ingredient list, unless the label indicates it’s derived from essential oils. Hydroquinone is a lightening compound that inhibits the production of skin pigmentation and is used to lighten melasma, freckles, age spots, and other skin discolorations. It’s known to increase exposure to UVA and UVB rays, and has been found to be mutagenic in laboratory studies. Hydroquinone can cause contact dermatitis as well as degeneration of collagen and elastin fibers. The Environmental Working Group has assigned a hazardous warning to this compound. Doctors advise women to avoid using it during pregnancy or nursing. In rare cases, it can cause “ochronosis,” a discoloration in dark-skinned people. Studies have shown liver effects at low doses, and tests on mammal cells have shown hydroquinone to have mutation (possibly carcinogenic) properties. Lead has been found in 61% of lipsticks tested by the Campaign for Safe Cosmetics. It’s a proven neurotoxin that can interfere with fetal development. It’s also been linked to infertility and miscarriage. It’s usually not shown on the ingredient list. Check the Safe Cosmetics Database (www.cosmeticsdatabase.com) for brands without lead. Parabens (including methyl, propyl, butyl, and ethyl parabens) are a group of preservatives used to extend the shelf life of cosmetic products. 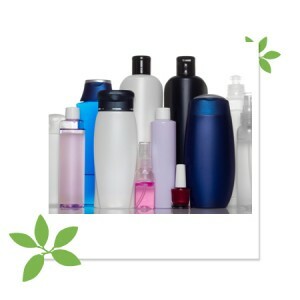 Estimates say over 90% of all cosmetics contain parabens. A 2006 study took urine samples from 100 adults and found two of these parabens (methyl- and n-propyl) in over 90 percent of them, with other parabens showing up in over half the samples. (Environ Health Perspect. 114 (12) 2006). Studies have also shown them to be estrogenic and capable of being absorbed by the body through the skin. Petrochemicals are derived from petroleum and include mineral oil, toluene, and petroleum oil. Petroleum is an economical mineral oil used for its emollient properties in cosmetics. It has no nutrient value for the skin and can produce photosensitivity. It may also interfere with the body’s own natural moisturizing mechanism, leading to dryness. Oddly enough, this ingredient often creates the conditions it claims to alleviate. Petroleum by-products coat the skin like plastic, clogging the pores. 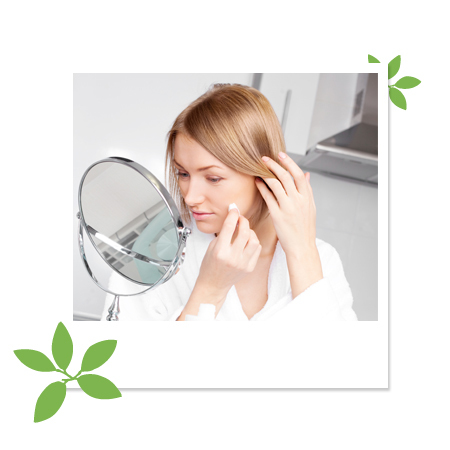 They interfere with skin’s ability to eliminate toxins, promoting acne and other disorders. They also slow skin function and cell development, resulting in premature aging. Watch out on this one-it’s used in many products. Even baby oil is 100% mineral oil. In addition, any mineral oil derivative can also be contaminated with cancer-causing PAHs (polycyclic aromatic hydrocarbons). Phthalates are chemicals produced from oil and used to make plastics. They’re also used as solvents in cosmetic products like nail polishes, perfumes, and hairsprays. (They help the product cling to the nail, hair, or skin.) These chemicals are readily absorbed by our fingernails, skin, and lungs. Animal studies with phthalates have resulted in damage to kidneys, liver, lungs, and reproductive systems. Human studies identified developmental abnormalities in male infants correlating to high phthalate levels in their mothers’ bodies. These compounds can lead to liver cancer and birth defects in lab animals. Watch out for ingredients like dibutyl phthalate (DBP), butylbenzylphthalate (BBP), and di(2-ethylhexyl) phthalate (DEHP). Propylene glycol is a synthetic petrochemical mix used as a humectant-a substance that promotes moisture retention and keeps products from drying out. It has been known to cause allergic reactions, hives, and eczema. This chemical is also drying to the skin. 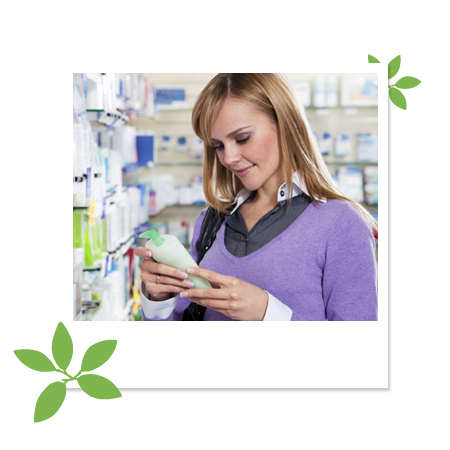 When you see PEG (polyethylene glycol) or PPG (polypropylene glycol) on labels, beware-these are related synthetics. Silicone-derived emollients are derived from silica and are used as water-binding agents (moisturizers) in cosmetics. These emollients, however, are occlusive-they coat the skin and don’t allow it to breathe (much like plastic wrap would do.) Recent studies have indicated that prolonged exposure of the skin to sweat, by occlusion, causes skin irritation. Some synthetic emollients are known tumor promoters and accumulate in the liver and lymph nodes. They are also non-biodegradable, negatively impacting the environment. They include dimethicone, dimethicone copolyol, and cyclomethicone. Stearalkonium chloride is an anti-static agent used in hair conditioners and creams. It can cause allergic reactions and is known to irritate skin. Developed by the fabric industry as a fabric softener, it’s a lot cheaper to use in hair-conditioning formulas than more beneficial ingredients like proteins and herbals. Synthetic dyes are used to make cosmetics look “pretty,” but are often made up of unrevealed, unsafe ingredients. They may be labeled as FD&C or D&C, followed by a color or a number (e.g., FD&C yellow No. 5). Most come from coal tar and are known to be carcinogenic. If they are on the ingredient list, do not use the product. Sulfates (like sodium lauryl and sodium laureth) are cheap, harsh detergents used in shampoos, body washes, and face cleansers for cleansing and foam-building properties. They can cause eye irritations, skin rashes, hair loss, dry skin, and allergic reactions. Sulfates are frequently disguised with the explanation that they “come from coconut.” The Journal of the American College of Toxicology concluded that through skin absorption, sulfates enter and maintain residual levels in the heart, lungs, and the brain. It also noted that sodium lauryl sulfate has a degenerative effect on the cell membranes because of its protein-denaturing properties. High levels of skin penetration may occur at even low-dose concentration. Talc is a mineral widely used as talcum powder. According to the American Cancer Society, talcum powder particles applied to the genital area, on sanitary napkins, or on condoms may migrate to the ovaries, where they can cause damage. Studies have found a higher risk of ovarian cancer among talc users. Talc can also be found in antacids, garden pesticides, some deodorants, and baby powders. Because the particles are ground to such a small size, they are easily carried in the air, like dust, and can get into the lungs. TEA, MEA, DEA are ammonia compounds often used in cosmetics as emulsifiers and/or foaming agents. DEA can also be found in some pesticides and is listed by the World Health Organization as an unclassified carcinogen. These chemicals contain ammonia compounds and can cause allergic reactions, eye irritation, and dryness of hair and skin. Any of the three can be toxic if absorbed into the body for a long period of time. If they come in contact with nitrates, they can form harmful nitrosamines, which can be carcinogenic. Toluene is used in nail polishes to make the polish form a smooth color across the nail. It affects the nervous system and can cause fatigue, mental confusion, dizziness, nausea, and headaches. Toluene may also negatively affect reproduction and fetal development. Triclosan is an antibacterial and antifungal agent present in all kinds of personal care, home care, and dental products-even though the FDA has reported that there is no evidence that antibacterial products protect people any better than regular soap. Triclosan has a chemical structure similar to dioxin-a class of toxic chemicals formed as by-products of the manufacture of chlorine-containing products. This similarity could lead to contamination of triclosan with dioxins. The agent has also been shown to be an endocrine disruptor and is accumulating in our soils and farm fields. Because of its widespread use, it may result in germs resistant to it. Ureas are synthetic ingredients widely used as preservatives as well as water-binding and exfoliating ingredients. (Also known as diazolidinyl urea, imidazolidinyl urea, or DMDM hydantoin and sodium hydroxymethylglycinate.) The American Academy of Dermatology has found them to be a primary cause for contact dermatitis. Urea has also been shown to release formaldehyde. Non-synthetic forms are derived from animal urine. Cosmetic Dictionary, Campaign for Safe Cosmetics, and the Environmental Working Group (EWG).